While it’s not unfair to look at employee health as a personal responsibility, it actually does have a place in successful organizations. 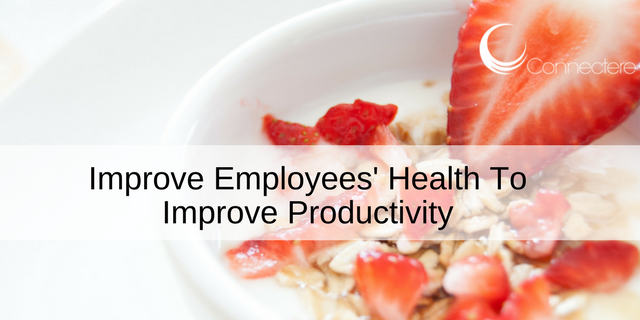 In fact, in a 2017 study published in Management Science, it was found that when employees participated in wellness programs in the workplace, they experienced improved health resulting in productivity increases of 10 percent. Let’s face it, with the demands of work and family, most employees might find it hard to find time or energy for physical activities outside of working hours. You can help employees live a more active lifestyle by creating the opportunities right at their workplace! An easy place to start promoting physical activity in the workplace is the use of active seating arrangements such as standing desks and workstations, both of which are gaining popularity these days. A 2015 publication by Preventive Medicine reviewed the results of multiple studies done on the topic of workplace desks and seating arrangements. generally elevate calorie bum, and individuals who used them tended to lose weight and inches from their waists. Perhaps what is more noteworthy about the results of the studies is that most of the researchers found that not having a chair to sit on did not negatively affect work performance. Another easy way to promote cardio activity at the workplace is to encourage employees to use the stairs whenever practical. A 2007 study published in Sports Science and Medicine found that when office workers use stairs just three times per day, their VO2 max – the measurement of the maximum amount of oxygen that an individual can utilize during intense, or maximal exercise – increased significantly. In addition to environmental prompts, HR can also consider using incentives to promote physical activities in the workplace. Even offering relatively low-cost incentives can play a part in motivating employees – especially the sedentary ones – to lead more active lifestyles. Offering employees nutritious choices in the workplace cafeteria can help encourage healthier eating and living. Reducing portion sizes of food, reducing prices of fruits and making changes to menus to include healthier items are examples of simple changes that can bring about substantial impact. Similarly, if you regularly serve food during training or staff meetings, try substituting sinful choices like donuts and brownies with more wholesome options such as whole grain bagels and fruits.